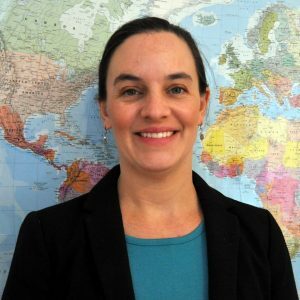 Professor Tilghman is a cultural anthropologist with interests in human migration, economic livelihoods, health, and food security. She has conducted research in Madagascar since 2002 on a variety of topics including entomophagy, medicinal plant knowledge exchange, equity issues related to bioprospecting, social and environmental impacts of small-scale sapphire mining, and rural-urban migration. More recently, she has examined the Malagasy diaspora in the USA and China. She also has begun working with refugee resettlement and support organizations in the state of New Hampshire. At PSU, she helps coordinate the Global Health minor with Professor Bob Heiner. Tilghman, L. M. 2017. The Malagasy Diaspora in the USA: Results from the 2017 survey. Research report submitted to the Embassy of the Republic of Madagascar. Tilghman, L. M. 2017. Matoy Jirofo, Masaka Lavany: using the clove commodity cycle to explore rural-urban linkages in Madagascar. American Anthropological Association annual meeting, ‘Boom and Bust: cultural dimensions of commodity cycles’ panel, Washington DC, 2 December 2017. Cherry, C. O., Chumbler, N. R., Richards, K., Huff, A., D. Wu, Tilghman, L. M., and Butler, A. 2015. Expanding stroke telerehabilitation services to rural veterans: a qualitative study on patient experiences using the robotic stroke therapy delivery and monitoring system program. Disability and Rehabilitation: Assistive Technology. Neimark, B. D., and Tilghman, L. M. 2014. Bioprospecting a Biodiversity Hotspot: The Political Economy of Natural Products Drug Discovery for Conservation Goals in Madagascar. In Conservation and Environmental Management in Madagascar, edited by Ivan Scales. Routledge, New York NY. Pp.271-298.